Orange Business Services (OBS) provides integrated telecoms and IT services to multinational organisations globally. It has operations in North and South America, Asia, the Middle East and Europe. The HR function is aligned to support both global business clusters and regional teams. The OBS HR function made the decision to move to a Shared Service Centre model, shifting the administration, process and procedural element of HR to a central function. The aim was to enable regional HR teams to add greater value to the business by operating more consultatively. This change required a shift in mindset and focus for HR professionals and a new way of working with their internal customers. 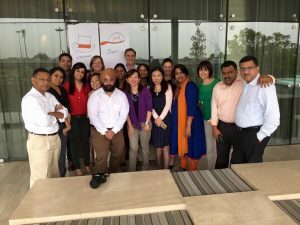 The challenge was to provide a consultancy skills’ development programme that would enable the global HR community to successfully make this transition and to cater for differing levels of experience and confidence in the regional teams. OBS engaged Learning Curve to design and deliver an HR Consulting Skills programme for their HR Professionals, from HR Consultants to Regional Heads of HR. The aim of the programme was to develop participants’ skills and confidence to partner with their internal customers. They needed to understand their customers’ business context, diagnose their needs and develop workable and agreed solutions. The programme focused on participants practising the tools and skills they would need to operate within the new HR model. Participants worked with case studies from their own customer base and received developmental feedback from peers and Learning Curve trainers. Participants left the programme with robust individual action plans and a development plan for the region. The programme was delivered in Europe, Asia, the Americas and the Middle East and received consistently positive feedback from participants. Each region has reported success in moving to a more consultative approach with their customers and the tools and skills have been embedded into their day to day operations. To support ongoing development and reinforce the learning from the programme, Learning Curve facilitated a virtual learning review, with participants from Europe and the Americas, nine months after the training took place. Both regions continue to develop their consulting practice and regularly review their progress at regional meetings.